I started up here at DotNetNuke Corporation here just over 11 weeks ago now, I guess I am really finishing my 12th week here tomorrow. I was employee #26 I believe, and since I started I believe we’ve grown even more and are now in the range of 38 or 39 employees! Possibly 40 if you count Will Strohl but he’s not starting up for a while, and he never really counts for much anyways (for those that don’t know, Will and I rip on each other when we blog)! There are two primary offices for DNN, one in San Mateo, California where I work, and one in Langley, Canada outside of Vancouver, though there are also a few remote workers over in the UK, Australia and even spread around the United States. 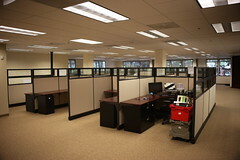 So as a growing company we quickly ran into trouble, we had too many people for the office spaces we were leasing. A couple of weeks ago the Canada office moved into their new digs, and while they don’t have any “current” photos up yet you can see a quick tour that Rob Chartier put together in a recent blog post. He’s promised to post some more photos soon of everything all setup. Here in California we also just moved into new office space over the past weekend. We moved about 1/2 mile southwest of where we were before, into a much larger space that will accommodate the team we’ve got setup here in California, and allow for growth! We still have a lot of work to do around the office, but here’s what it looks like midway through our first week here. When you first walk in the doors you currently see this open space. Eventually we’ll have something setup here, possibly couches, I’m hoping a TV and Xbox! Turn to the right and you will see the start of the cubes, they look empty, I just happened to snap photos before some people had come into the office. We’ve got our own kitchen space now, which is nice, at the old office we had a refrigerator/snacks in the conference room, and the water dispenser Matt and Susan’s office. Our conference room has already seen it’s fair share of use, with Shaun Walker down here at the office yesterday, here’s a shot of some of the team getting ready to meet with him. As we get more things done around the office I’ll post another update. I’m hoping to work in an Xbox for office use, I know Will is going to back me up on that request when he gets here!